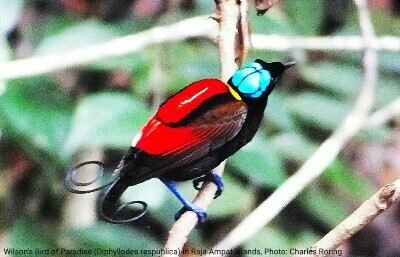 Birds of Paradise are beautiful animals that live in tropical rainforest of New Guinea (PNG and West Papua). They have attracted a lot of visitors from all corners of the world to come and see them. There are 42 species that are known to science and 38 of them live in New Guinea. There are several places in West Papua province of Indonesia that have become tourist destinations for watching paradise birds. Some of them include Susnguakti forest in Manokwari, Syuan river in Tambrauw regency, the forest of Klatomok of Sorong regency and Mamdifu river in Waigeo island of Raja Ampat. Visitors spend between 3 days to 2 weeks to watch the birds and explore the bio-diversity of tropical rainforest. 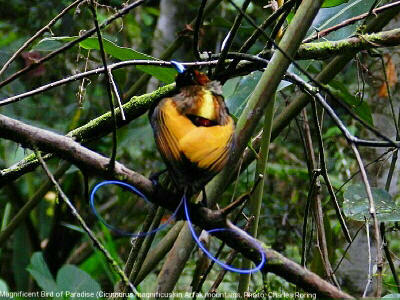 Lesser Birds of Paradise (Paradisaea minor) live in lowland and lower montane forest of West Papua. 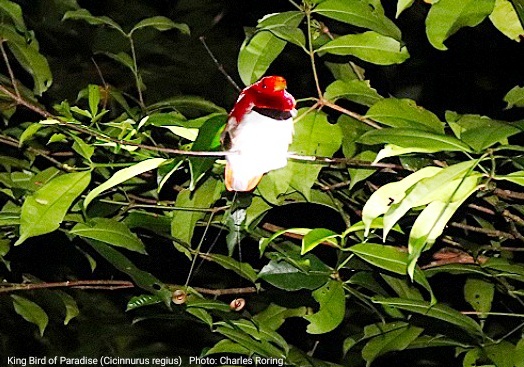 There are also King Bird of Paradise (Cicinnurus regius), Magnificent Riflebird (Ptiloris magnificus) and Glossy-mantled Manucode (Manucodia ater).The recommended sites for watching these paradise birds are Klabolo forest in Sorong regency, Arfak Mountains in Manokwari regency and in Tambrauw Mountains. They are usually active in the mornings and in the afternoons. The male Lesser Birds of Paradise compete one another to win the heart of their female birds by performing courtship dance and showing their beautiful dance. They usually dance on the branches of a tree whose heights are between 10 to 20 meters above the ground. Birdwatchers who want to see them need to bring binoculars such as the 10x42 mm or 8x21 mm. A D-SLR camera with at least 400 mm lens or higher is needed to take pictures of the birds. Birdwatching is a multi-sport recreational activities that visitors can enjoy while visiting forests in West Papua. Birds are usually active in the mornings and in the afternoons. The birding ground of paradise birds is usually located very deep in the jungle. To reach it, birdwatchers have to wake up early in the morning and walk for half an hour or more. They also have to wear darker color clothing to increase their chance of watching the birds. The courtship display and behaviour depends on the species of birds that visitors watch. For Western Parotia (Parotia sefilata), the male bird dances on the ground. 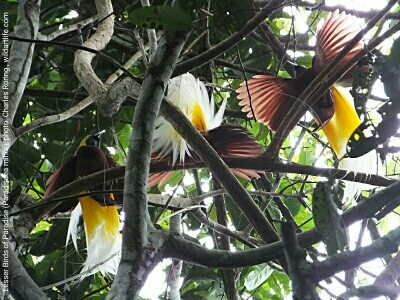 For Magnificent Bird of Paradise (Cicinnurus magnificus) that live in Arfak mountains of Manokwari, the male shows his beautiful feather to the female birds on shrub plants just about 30 cm to 1 meter from the ground areas. The ground where Birds of Paradise dance or exhibit the beauty of their feather have to be very clean and free from fallen leaves and twigs. 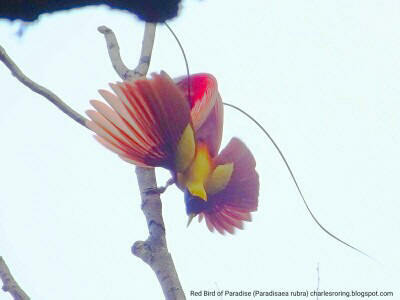 Red Bird of Paradise (Paradisaea rubra) and Wilson's Bird of Paradise (Diphyllodes respublica) are an endemic species that lives in the jungle of Raja Ampat archipelago, particularly in the islands of Waigeo, Batanta and Gam. I personally saw the Red BOPs at the bank of Warafar river and Mamdifu river in Waigeo island when I organized a birding tour for an American photographer and Indian birdwatchers on two separate trips. For watching Wilson's BOP, I went to the southern region of Waigeo island. Usually the trip to watch paradise birds in Raja Ampat is combined with snorkeling activities at the bearch near the guesthouse which I and the birding tour participants stay. To enhance birding experience, birdwatchers need to bring binoculars and spotting scope. Birding optics can be bought in specialized outdoor sport shops that sell equipment for birdwatchers, hunters. As a matter of fact people can buy birding equipment from online store such as Amazon.com or Aliexpress.com. Birders can choose 8x21 Pentax, 10x 42 mm Visionking. The most recommended Nikon EDG 10X42 will be a perfect choice. Bridge cameras such as Canon SX60HS and Nikon Coolpix P900 are more affordable photographic device that birdwatchers can bring while walking in the jungle to shoot birds and any wild animals. If you are interested in taking birdwatching tour in Klasow valley and want me to be your guide, you could contact me by email to: peace4wp@gmail.com and I will be happy to organize your birding trip to see the paradise birds.